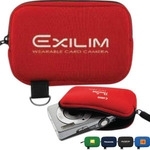 Safeguard your digital camera from dust, scratches and bumps with our fashionable neoprene camera case. It’s compatible with a variety of cameras. Available in black, green, navy, blue, red and royal blue.